Those of us fortunate enough to have experienced Grandma's love will know what I am about to pen down here. As a mother, I now see that time spent with grandma translates to a whole new set of rules, little or no self control over sweet treats and mild discipline at best. Very different perspective for my mother who is now a grandmother herself! My childhood was spent in another country. I often reminisce about the days spent in my grandmother's home...waking up to the aroma of comforting food, going out with her to the garden to pick fresh flowers for the house and snuggling with her for story time. More than 3 decades have passed but I still remember everything so vividly. Perhaps because she touched my heart in more ways than one. My grandmother celebrated her 80th birthday a few years back. Time has taken a toll on her health. 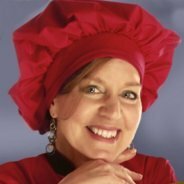 She can no longer cook or garden. Nor can she remember all the memories of the past. But despite the age and failing health, she has not lost the love in her voice or the concern for her grandkids. This cake was a first for me with fondant decorations and was handcrafted to honor her on her 80th birthday. The cake flavor was a mellow lemon with apricot-pineapple preserve as the filling. 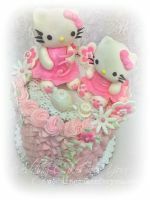 Edible roses were hand-made with fondant one by one to honor the love and patience that she and all grandmothers symbolize all over the world. They say, anything in excess is never good. I BELIEVE THERE IS ONE EXCEPTION. Abundant doses of a grandmothers love teaches kids freedom from structure, how to laugh at imperfections and how to take the time to stop and smell the roses. No one has more patience than a grandmother. She is here on earth to serve a special purpose: to cascade love all the way! Elegance, beauty and a touching story! truly lovely thoughts and work accompanied by a beautiful cake for a loving grandma... what a treat to eyes! A feast for the eyes and soul! Gorgeous cake and looks delicious too!!! Great going!!! what a lovely living tribute to your grandma! Sadly, my grandmas passed before I had a chance to meet them, as such my mission is to have my kids experience as much time as they can with my parents and my husbands mom so that they can get filled with the special love that only grandparents can give! ... which is what grandmas have. They realize that stopping to smell the roses is to be in the present moment. This is the best way to live but has always been a challenge in any society with the rush to the next thing or too much reflection on the past. My connection to my maternal grandmother is via knitting. My connection to my faternal grandmother is healthy eating. She was a health nut and that passed to me via my father. Baking apple pie brings memories of family and picking fruit from the trees in the first house my parents bought. How wonderful... I whole heartedly agree... my son is enjoying the presence of his grandmother now..
You are a gifted artist Sumita, I hope you will spend more time on writing and baking. 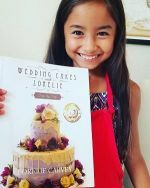 thanks for sharing your story and pictures of your amazing cake! Beautiful Sentiment - and Cake! Beautiful Sumita. Love the cake and the memories. I loved baking with my grandmother too. She made the best pie crust I've ever eaten. I miss her every day. Thank you for reminding me of those times in the kitchen with her! Grandmothers are the best! A very touching tribute to a loving grandma by a granddaughter... really lovely and brought back good old memories with my own grandma and Grandpa.. Best wishes..
Gorgeous cake! Lucky grandma to have a glimpse of this cake! Beautiful cake with lovely story.. 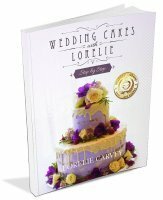 Very well written, an elegant beautiful cake that sounds delicious. So elegant and beautiful... This is art with tons of love and care! Lovely cake...wrapped around very heart warming emotions...surely a walk down the memory lane with truely cherished grandma's love! Grandma's love and this cake.....lovely! Beautiful story for a beautiful cake. Your cake reminds me of my grandma. She left me long long ago. She used to wait for me untill I returned from school. WHY......,,because she loved to feed me with her own hand. She cooked delicious dishes,I cannot forget the taste. our grandmother - as the centered root of strength and love in our life. Wonderful cake with a touching tribute to a grandma by her loving granddaughter... lovely. Simple but filled with love and radiance. Good luck. 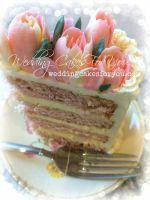 Simply beautiful words to suit a simply beautiful cake! 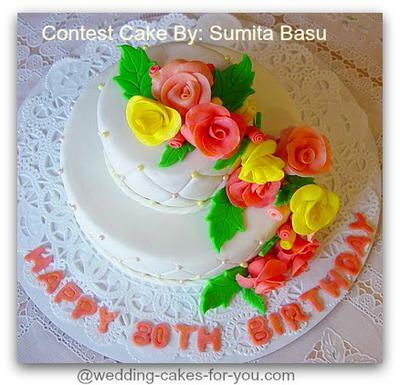 Beautiful cake and beautiful story to go along with it, Sumita! Best of luck to you in the contest! 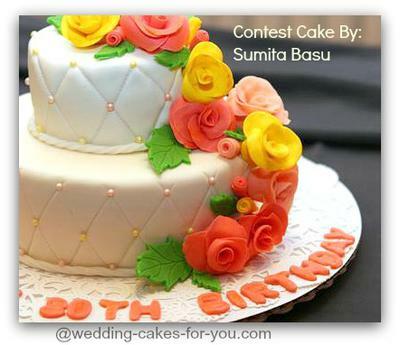 You have created a beautiful cake and a wonderful heart touching story... Good luck! This is a lovely cake with an icing of genuine love that makes it even more yummy!!! Thanks for sharing your story. Makes me think, happiness lies in small little things in life. This is full of warmth and genuine affection which one can only experience. Can completely relate and share your thoughts. I guess that is why all grandmas have the same genetic code ! What a beautiful story to go with a lovely cake! Grandmothers are indeed special and this homage to Grandma is very moving. Very nice job!! I cannot agree more with these words and feel privileged to have received a small part of that love. Love daadima. Join in and write your own page! It's easy to do. How? 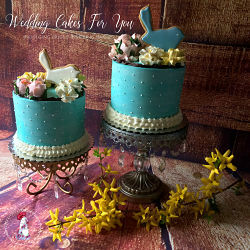 Simply click here to return to Cake Decorating Contest Fundraiser To Benefit Icing Smiles.